Time for Your 2017 Franchised Dealer Bond Renewal! Florida franchised dealers will have their licenses and auto dealer bonds expire on December 31. While you can renew your license even as late as December 31, your bond renewal needs to happen earlier. Start your renewal application. 100% money-back guarantee! Here’s what you need to know concerning the upcoming Florida auto dealer bond and license renewal. Why do I need to renew my license? Not renewing your license will lead to it expiring and getting revoked. The licensing period for Franchised motor vehicle dealers is January 1 – December 31. If you fail to renew your license by December 31, you may still do so during the 45 days delinquent period after your license expiration date (until February 14). And if you fail to renew by February 14, you will need to apply from scratch for an entirely new dealer license. Keep in mind that in order to renew your license within the delinquent period you will need to pay a delinquent fee of $175 instead of your regular $75 renewal fee. What do I need to do to renew my license? On October 12, the Department of Highway Safety and Motor Vehicles e-mailed or mailed all franchised motor vehicle dealers with a renewal notice and application. To renew your license, you need to submit your renewal license application to your Regional office (see list of offices here). In case you can’t find the e-mail, here’s the HSMV 86720 renewal application that you need to complete. If you opt to renew your license for a two-year (biennial) period, you will need to pay a $150 renewal fee, instead of the yearly $75. While you can submit your license renewal application as late as December 31, the Department requests that renewals are submitted 30 days prior to the license expiration date. This way it can provide good and timely service to everyone. How much will my bond renewal cost? 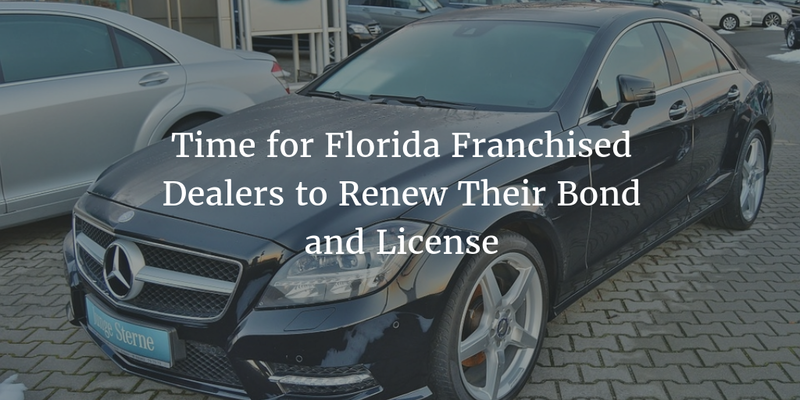 All franchised dealers in Florida are required to obtain and annually (or biennially) renew a $25,000 Florida auto dealer bond. If your credit score and overall financial status has not changed significantly over the last year, you can expect to receive more or less the same rate as last time around. If your credit score has improved tangibly you are likely to get a better rate by your surety. Conversely, if your score or financial status has suffered, you will probably have to pay more for your bond this year. To find out the exact cost of your bond, just submit a surety bond application and we will provide you with a FREE quote on your bond. If you’d like to know more about how your credit score a nd financial stability determine your rate, see our surety bond cost page. How do I get my Florida auto dealer bond? If Lance Surety Bonds is your bonding agency, you will receive early notification about your bond renewal deadline. Along with the notification, we will provide you with a quote on your bond. To renew your bond, just fill out the attached form and send it back to us. If you’d like to get your bond with us or if you’d like to renew now, just fill out our online application. We will then provide you with your free quote and with instructions about how to finalize your bonding agreement. Call us at (877)-514-5146 or contact us online if you have any further questions regarding your bond renewal or the bonding requirements. We will be happy to help!